One of my favorite summer trips is to America’s Mart in Atlanta. I have been going there since college when I worked for Davison’s Department Store in their gourmet cookware department. Davison’s is now gobbled up in the Macy’s conglomerate and my cool job is long gone, but my love for the Mart remains. First of all, the architecture is beautiful. 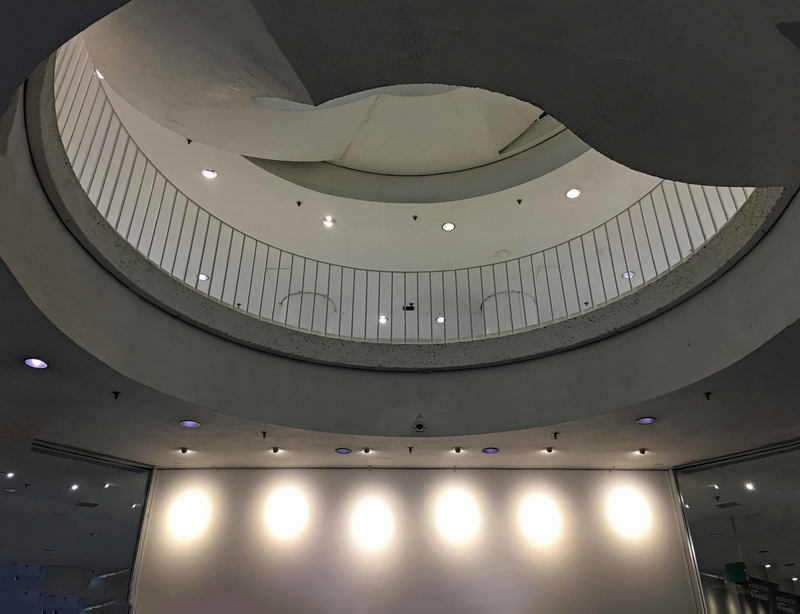 I love the layers of white walls with plants and the open curved staircases. If you live in Atlanta it will be no surprise that John Portman designed this building in 1961. 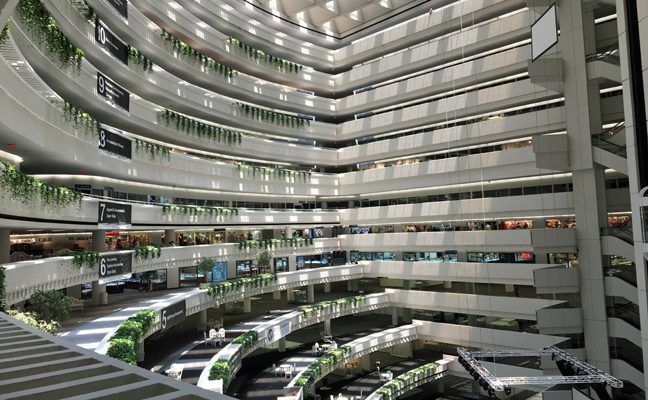 John Portman has an impressive list of gorgeous buildings from around the world in his portfolio. We are lucky to have many of them in Atlanta. 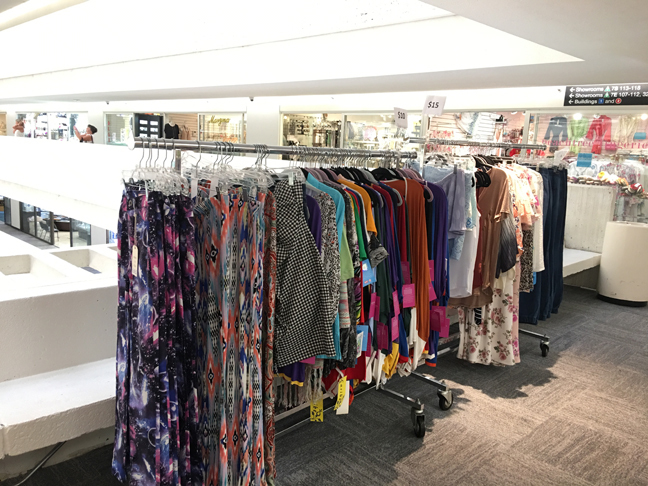 When you are inside, you can buy clothes and jewelry and usually get some sneak previews to upcoming fashions. If you are not good at making decisions, then the Mart is not the place for you. 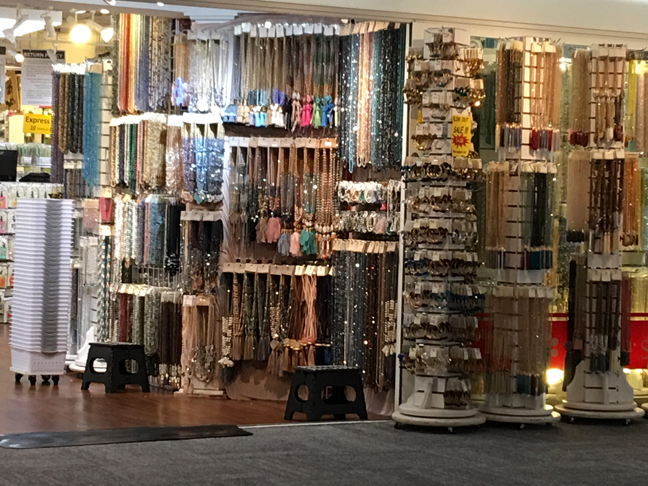 There are stores and stores full of purses, jewelry, scarves….whatever you need. Or maybe I should say whatever you “want.” There aren’t a lot of life’s necessities there. Just a lot of cool, fun stuff. 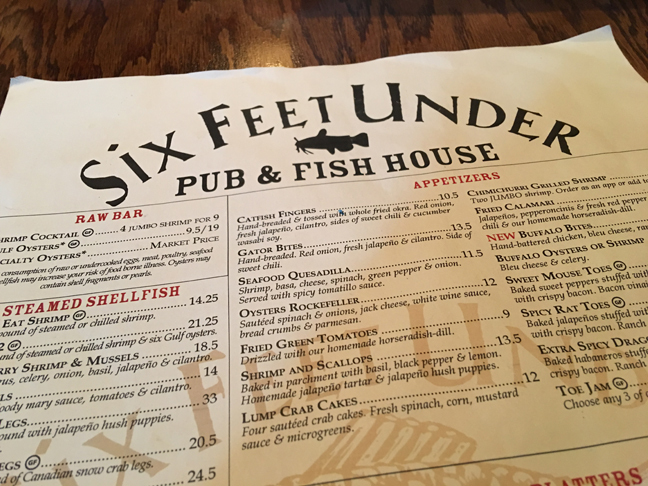 After a day of shopping, we headed over to a local favorite restaurant, Six Feet Under. 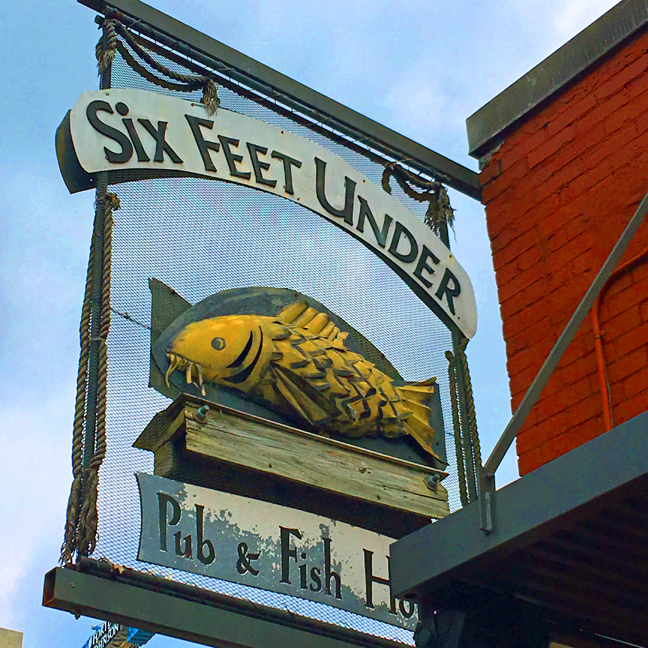 This restaurant overlooks the historic Oakland Cemetery. 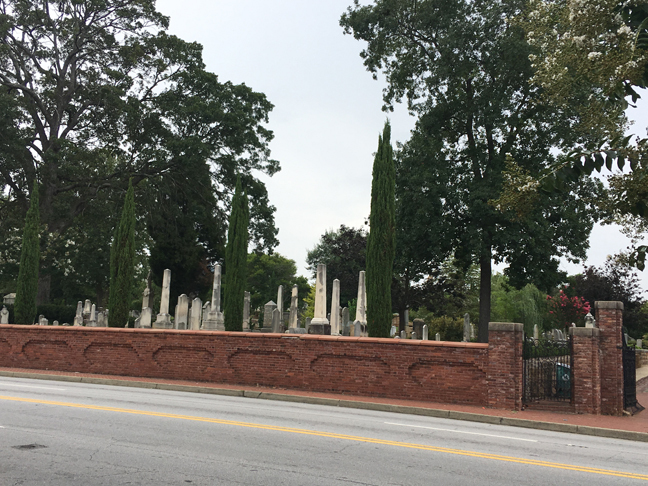 Inside the walls of the cemetery you will find the final resting place of Margaret Mitchell, author of Gone with the Wind, golfing great Bobby Jones, and Atlanta’s first mayor Moses Formwalt. I once took tour of the cemetery for a class at Georgia State University. The city fathers designed Oakland Cemetery as a garden cemetery with walkways, plants, and statuary rather than a traditional crowded and undecorated graveyard as was the tradition at the time in the late 1800’s. 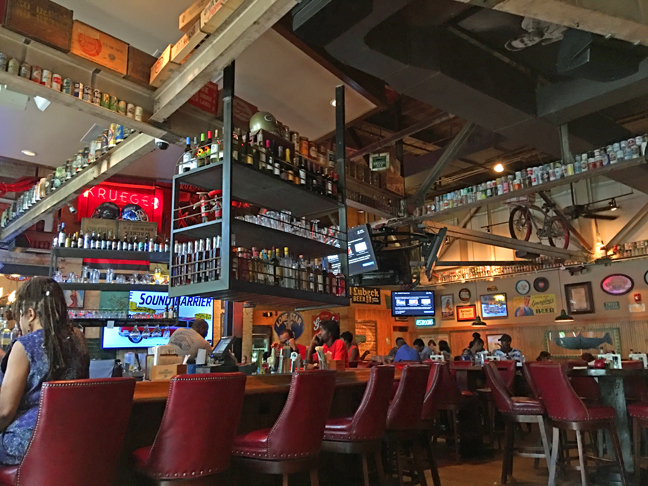 Inside the walls of the restaurant you will find many beer cans and a fun decor. I was tempted by the salmon sliders but fried green tomatoes always call my name. 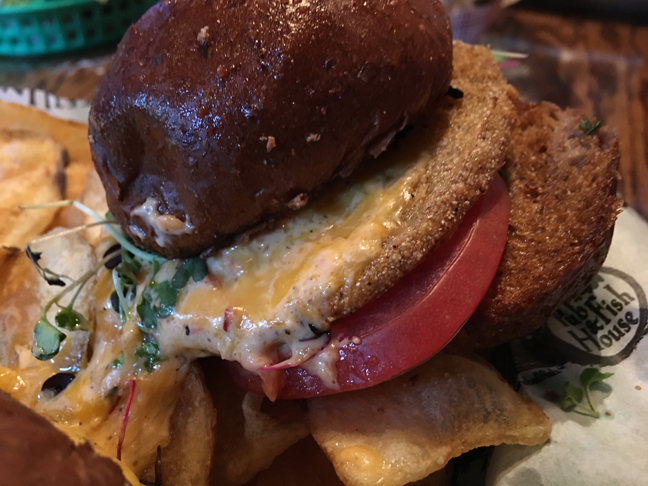 The pimiento cheese melted on top of the fried tomato slice was a perfect combination. I would have to rank this sandwich near the top of my many fried green tomato orders in my life. 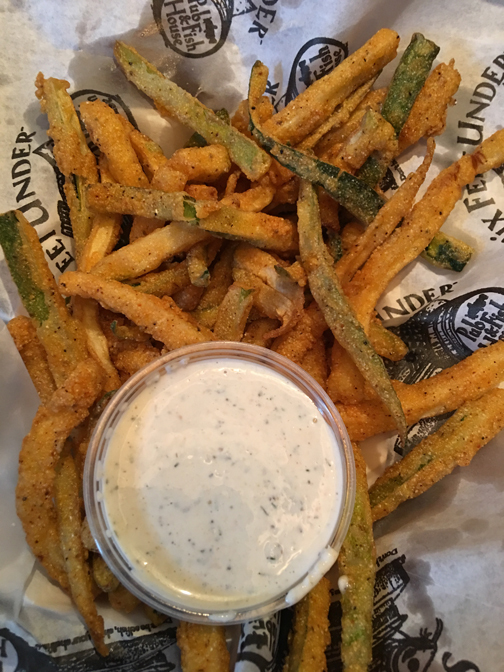 Gina ordered zucchini fries. Very tasty with the horseradish dill dressing. Another fun day with my friends! Now off to have show-and-tell with our new goodies from the Mart. Glad you’re back Julie!!! I love your insight and humor…..and you!!! Thanks! Hopefully I won’t have any more long breaks!